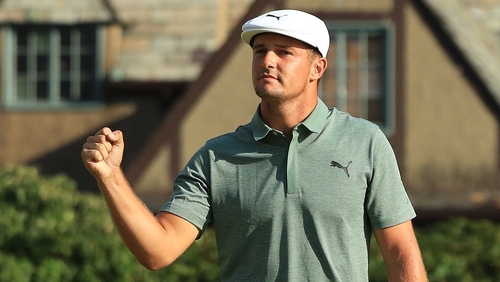 Bryson DeChambeau shot an eight-under-par 63 to claim a four-stroke lead heading into the final day of the Northern Trust. The American's third round, which featured nine birdies, took him to 16 under par at Ridgewood County Club in Paramus, New Jersey. Waterford's Seamus Power is one one under after 54 holes, in a tie for 58th, one bogey on the way out and two birdies on the back nine giving the 31 year old his first sub par round of the week. Tiger Woods was level with Power heading into the weekend after two level-par 71s, but he found some form at the weekend - shooting at three-under-par 68 to take a tie for 48th going into the final round. DeChambeau's closest challenger in the first of the four FedEx Cup events was fellow American Keegan Bradley, who climbed through the field to reach 12 under with the day's best round of 62. England's Tommy Fleetwood, three off the overnight lead, dropped into a tie for 36th on five under after a 73. Tiger Woods moved to three under following a 68.